Contact us about hosting a Fairy Garden Birthday Party ! 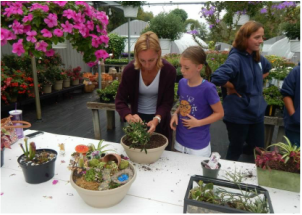 Visit us at Patceez for Fairy Garden Classes! A great activity for kids and adults! Classes are available upon request. Call to schedule yours today! Price is $45 per garden and includes starting materials! Mom and daughter teaming up to make one garden? Only $45! Click here to see our fairy garden supplies! Call 401.377.4825 to book your spot! *Ask us about booking a Fairy Garden Birthday Party! The Holidays are just around the corner and it's time to get in the spirit! What better way than to spend a fun afternoon or evening making and decorating your very own evergreen wreath! 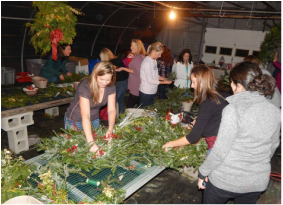 Bring your friends and a bottle of wine for a great time constructing and decorating a personalized wreath that will adorn your home through the holidays! Class is $45 per wreath and includes greens, bow, and decorations! Or schedule a private party for a group of 10 or more! Call for more information!